For the medical journal, see Arthroscopy (journal). Arthroscopy (also called arthroscopic or keyhole surgery) is a minimally invasive surgical procedure on a joint in which an examination and sometimes treatment of damage is performed using an arthroscope, an endoscope that is inserted into the joint through a small incision. Arthroscopic procedures can be performed during ACL reconstruction. Lateral meniscus located between thigh bone (femur, above) and shin bone (tibia, below). The tibial cartilage displays a fissure (tip of teaser instrument). The advantage over traditional open surgery is that the joint does not have to be opened up fully. For knee arthroscopy only two small incisions are made, one for the arthroscope and one for the surgical instruments to be used in the knee cavity. This reduces recovery time and may increase the rate of success due to less trauma to the connective tissue. It has gained popularity due to evidence of faster recovery times with less scarring, because of the smaller incisions. Irrigation fluid (most commonly 'normal' saline) is used to distend the joint and make a surgical space. 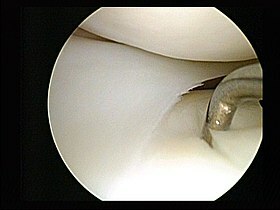 Knee arthroscopy, or arthroscopic knee surgery, is an ineffective surgery that uses arthroscopic surgical techniques. People who undergo this surgery for "wear and tear" joint pain, including osteoarthritis and meniscal tears, usually have high hopes for the results, this is sometimes the case but from one to time the result is no better then before. That said it’s always worth trying and cannot worsen the damage physical therapy. It has, in many cases, replaced the classic open surgery (arthrotomy) that was performed in the past. Arthroscopic knee surgery is one of the most common orthopaedic procedures, performed approximately 2 million times worldwide each year. The procedures are more commonly performed to treat meniscus injury and to perform anterior cruciate ligament reconstruction. While knee arthroscopy is commonly used for partial meniscectomy (trimming a torn meniscus) on middle aged to older adults with knee pain, the claimed positive results seem to lack scientific evidence. During an average knee arthroscopy, a small fiberoptic camera (the arthroscope) is inserted into the joint through a small incision, about 4 mm (1/8 inch) long. More incisions might be performed in order to visually check other parts of the knee and to insert the miniature instruments that are used to perform surgical procedures. The BMJ Rapid Recommendations group makes a strong recommendation against arthroscopy for osteoarthritis on the basis that there is high quality evidence that there is no lasting benefit and less than 15% of people have a small short-term benefit. There are rare but serious adverse effects that can occur, including venous thromboembolism, infections, and nerve damage The BMJ Rapid Recommendation includes infographics and shared decision making tools to facilitate a conversation between doctors and patients about the risks and benefits of arthroscopic surgery. Two major trials of arthroscopic surgery for osteoarthritis of the knee found no benefit for these surgeries. Many medical insurance providers are now reluctant to reimburse surgeons and hospitals for what can be considered a procedure which seems to create the risks of surgery with questionable or no demonstrable benefit. However this is still a widely adopted treatment for a range of conditions associated with osteoarthritis, including labral tears, femoroacetabular impingement, osteochondritis dissecans. A 2017 meta-analysis confirmed that there is only a very small and usually unimportant reduction in pain and improvement in function at 3 months (e.g. an average pain reduction of approximately 5 on a scale from 0 to 100). A separate review found that most people would consider a reduction in pain of approximately 12 on the same 0 to 100 scale important—suggesting that for most people, the pain reduction at 3 months is not important. Arthroscopy did not reduce pain or improve function or quality of life at one year. There are important adverse effects. One of the primary reasons for performing arthroscopies is to repair or trim a painful and torn or damaged meniscus. The technical terms for the surgery is arthroscopic partial meniscectomy (APM). Arthroscopic surgery, however, does not appear to result in benefits to adults when performed for knee pain in patients with osteoarthritis who have a meniscal tear. This may be due to the fact that a torn meniscus may often not cause pain and symptoms, which may be caused by the osteoarthritis alone. Some groups have made a strong recommendation against arthroscopic partial meniscectomy in nearly all patients, stating that the only group of patients who may - or may not - benefit are those with a true locked knee. Professional knee societies, however, highlight other symptoms and related factors they believe are important, and continue to support limited use of arthroscopic partial meniscectomy in carefully selected patients. Hip arthroscopy was initially used for the diagnosis of unexplained hip pain, but is now widely used in the treatment of conditions both in and outside the hip joint. The most common indication currently is for the treatment of femoroacetabular impingement (FAI) and its associated pathologies. Hip conditions that may be treated arthroscopically also includes labral tears, loose / foreign body removal, hip washout (for infection) or biopsy, chondral (cartilage) lesions, osteochondritis dissecans, ligamentum teres injuries (and reconstruction), Iliopsoas tendinopathy (or ‘snapping psoas’), trochanteric pain syndrome, snapping iliotibial band, osteoarthritis (controversial), sciatic nerve compression (piriformis syndrome), ischiofemoral impingement and direct assessment of hip replacement. Arthroscopy is commonly used for treatment of diseases of the shoulder including subacromial impingement, acromioclavicular osteoarthritis, rotator cuff tears, frozen shoulder (adhesive capsulitis), chronic tendonitis, removal of loose bodies and partial tears of the long biceps tendon, SLAP lesions and shoulder instability. The most common indications include subacromial decompression, bankarts lesion repair and rotator cuff repair. All these procedures were done by opening the joint through big incisions before the advent of arthroscopy. Arthroscopic shoulder surgeries have gained momentum in the past decade. "Keyhole surgery" of the shoulder as it is popularly known has reduced inpatient time and rehabilitation requirements and is often a daycare procedure. Arthroscopic view showing two of the wrist bones. Arthroscopy of the wrist is used to investigate and treat symptoms of repetitive strain injury, fractures of the wrist and torn or damaged ligaments. It can also be used to ascertain joint damage caused by wrist osteoarthritis. Many invasive spine procedures involve the removal of bone, muscle, and ligaments to access and treat problematic areas. In some cases, thoracic (mid-spine) conditions require a surgeon to access the problem area through the rib cage, dramatically lengthening recovery time. Arthroscopic procedures (also endoscopic spinal procedures) allow access to and treatment of spinal conditions with minimal damage to surrounding tissues. Recovery times are greatly reduced due to the relatively small size of incision(s), and many patients are treated as outpatients. Recovery rates and times vary according to condition severity and the patient's overall health. Arthroscopy of the temporomandibular joint is sometimes used as either a diagnostic procedure for symptoms and signs related to these joints, or as a therapeutic measure in conditions like temporomandibular joint dysfunction. TMJ arthroscopy can be a purely diagnostic procedure, or it can have its own beneficial effects which may result from washing out of the joint during the procedure, thought to remove debris and inflammatory mediators, and may enable a displaced disc to return to its correct position. Arthroscopy is also used to visualize the inside of the joint during certain surgical procedures involving the articular disc or the articular surfaces, similar to laparoscopy. Examples include release of adhesions (e.g., by blunt dissection or with a laser) or release of the disc. Biopsies or disc reduction can also be carried out during arthroscopy. It is carried out under general anesthetic. Professor Kenji Takagi in Tokyo has traditionally been credited with performing the first arthroscopic examination of a knee joint, in 1919. He used a 7.3 mm cystoscope for his first arthroscopies. Recently it has been discovered that the Danish physician Severin Nordentoft reported on arthroscopies of the knee joint in 1912 at the Proceedings of the 4lst Congress of the German Society of Surgeons at Berlin. He called the procedure (in Latin) arthroscopia genu, and used sterile saline or boric acid solution as his optic media, and entering the joint by a portal on the outer border of the patella. It is not clear if these examinations were of deceased or of living patients. Pioneering work began as early as the 1920s with the work of Eugen Bircher. He published several papers in the 1920s about his use of arthroscopy of the knee for diagnostic purposes. After diagnosing torn tissue, he used open surgery to remove or repair the damaged tissue. Initially, he used an electric Jacobaeus thoracolaparoscope for his diagnostic procedures, which produced a dim view of the joint. Later, he developed a double-contrast approach to improve visibility. He gave up endoscopy in 1930, and his work was largely neglected for several decades. While he is often considered the inventor of arthroscopy of the knee, the Japanese surgeon Masaki Watanabe, MD, receives primary credit for using arthroscopy for interventional surgery. Watanabe was inspired by the work and teaching of Dr Richard O'Connor. Later, Dr. Heshmat Shahriaree began experimenting with ways to excise fragments of menisci. The first operating arthroscope was designed by them, and they worked together to produce the first high-quality color intraarticular photography. The field benefited significantly from technological advances, particularly advances in flexible fiber optics during the 1970s and 1980s. Arthroscopy surgical skills have been traditionally taught in cadaver labs, although the progression to in vivo operations varies from country to country. The International Society of Arthroscopy, Knee Surgery and Orthopaedic Sports Medicine (ISAKOS) holds a list of approved courses for gaining surgical skills. A new teaching technique uses medical simulation as an alternative to cadaver training. High fidelity simulators range from those that use real surgical tools and passive haptics, such as VirtaMed's ArthroS™, to those that rely on active haptic feedback, such as the Arthro Mentor from Simbionix. When studied, passive haptics have shown "high scores in terms of realism" and the ability to differentiate between "varying levels of arthroscopic experience". Reference material, such as the application developed by Touch Surgery, also contains visualization of minimally invasive techniques. Arthroscopy is considered a low risk procedure with a very low rates of serious complications. Commonly, irrigation fluid may leak (extravasates) into the surrounding soft tissue, causing edema which is generally a temporary phenomenon, taking anywhere from 7–15 days to completely settle. Rarely, this fluid may be the cause of a serious complication, compartment syndrome. However, Postarthroscopic glenohumeral chondrolysis (PAGCL) is a rare complication of arthroscopic surgery and involves chondrolysis wherein the articular cartilage of the shoulder undergoes rapid, degenerative changes shortly after arthroscopic surgery. ^ Millar, Neal L.; Wu, Xiao; Tantau, Robyn; Silverstone, Elizabeth; Murrell, George A. C. (2009-04-01). "Open versus Two Forms of Arthroscopic Rotator Cuff Repair". Clinical Orthopaedics and Related Research. 467 (4): 966–978. doi:10.1007/s11999-009-0706-0. ISSN 0009-921X. PMC 2650068. PMID 19184264. ^ a b c d e f Brignardello-Petersen R, Guyatt GH, Buchbinder R, Poolman RW, Schandelmaier S, Chang Y, Sadeghirad B, Evaniew N, Vandvik PO, et al. (May 2017). "Knee arthroscopy versus conservative management in patients with degenerative knee disease: a systematic review". BMJ Open. 7 (5): e016114. doi:10.1136/bmjopen-2017-016114. PMC 5541494. PMID 28495819. ^ Jameson, S. S.; Dowen, D.; James, P.; Serrano-Pedraza, I.; Serrano-Pedraza, Deehan; Reed, M. R.; Deehan, D. J. (October 2011). "The burden of arthroscopy of the knee: a contemporary analysis of data from the English NHS". The Journal of Bone and Joint Surgery. British Volume. 93 (10): 1327–1333. doi:10.1302/0301-620X.93B10.27078. ISSN 2044-5377. PMID 21969430. ^ Järvinen, Teppo L N; Guyatt, Gordon H (20 July 2016). "Arthroscopic surgery for knee pain". BMJ. 354: i3934. doi:10.1136/bmj.i3934. PMID 27439983. ^ Kirkley, Alexandra; Birmingham, Trevor B.; Litchfield, Robert B.; Giffin, J. Robert; Willits, Kevin R.; Wong, Cindy J.; Feagan, Brian G.; Donner, Allan; Griffin, Sharon H. (2008-09-11). "A Randomized Trial of Arthroscopic Surgery for Osteoarthritis of the Knee". New England Journal of Medicine. 359 (11): 1097–1107. doi:10.1056/nejmoa0708333. ISSN 0028-4793. PMID 18784099. ^ Moseley JB, O'Malley K, Petersen NJ, et al. (July 2002). "A controlled trial of arthroscopic surgery for osteoarthritis of the knee". N. Engl. J. Med. 347 (2): 81–8. doi:10.1056/NEJMoa013259. PMID 12110735. ^ "Hip Arthroscopy Surgery in Sydney — From Dr. Sunny Randhawa (June 2015)". Retrieved 2008-01-14. ^ Devji T, Guyatt GH, Lytvyn L, Brignardello-Petersen R, Foroutan F, Sadeghirad B, Buchbinder R, Poolman RW, Harris IA, Carrasco-Labra A, Siemieniuk RA, Vandvik PO, et al. (May 2017). "Application of minimal important differences in degenerative knee disease outcomes: a systematic review and case study to inform BMJ Rapid Recommendations". BMJ Open. 7 (5): e015587. doi:10.1136/bmjopen-2016-015587. PMC 5777462. PMID 28495818. ^ Thorlund, J. B.; Juhl, C. B.; Roos, E. M.; Lohmander, L. S. (2015-06-16). "Arthroscopic surgery for degenerative knee: systematic review and meta-analysis of benefits and harms". BMJ. 350: h2747. doi:10.1136/bmj.h2747. ISSN 1756-1833. PMC 4469973. PMID 26080045. ^ Khan, M; Evaniew, N; Bedi, A; Ayeni, OR; Bhandari, M (7 October 2014). "Arthroscopic surgery for degenerative tears of the meniscus: a systematic review and meta-analysis". CMAJ : Canadian Medical Association Journal. 186 (14): 1057–64. doi:10.1503/cmaj.140433. PMC 4188648. PMID 25157057. ^ Englund M, Guermazi A, Gale D, et al. (September 2008). "Incidental meniscal findings on knee MRI in middle-aged and elderly persons". N. Engl. J. Med. 359 (11): 1108–15. doi:10.1056/NEJMoa0800777. PMC 2897006. PMID 18784100. ^ Stone, Jonathan A.; Salzler, Matthew J.; Parker, David A.; Becker, Roland; Harner, Christopher D. (2017-04-21). "Degenerative meniscus tears - assimilation of evidence and consensus statements across three continents: state of the art". Journal of ISAKOS: Joint Disorders & Orthopaedic Sports Medicine. 2 (2): 108–119. doi:10.1136/jisakos-2015-000003. ^ Beaufils, Ph; Becker, R.; Kopf, S.; Englund, M.; Verdonk, R.; Ollivier, M.; Seil, R. (2017-02-01). "Surgical management of degenerative meniscus lesions: the 2016 ESSKA meniscus consensus". Knee Surgery, Sports Traumatology, Arthroscopy. 25 (2): 335–346. doi:10.1007/s00167-016-4407-4. ISSN 0942-2056. PMC 5331096. PMID 28210788. ^ a b Wray D, Stenhouse D, Lee D, Clark AJ (2003). Textbook of general and oral surgery. Edinburgh [etc. ]: Churchill Livingstone. pp. 173–178. ISBN 978-0443070839. ^ Kalantzis A, Scully C (2005). Oxford handbook of dental patient care, the essential guide to hospital dentistry (2nd ed.). New York: Oxford University Press. pp. 116, 117. ISBN 9780198566236. ^ Guo, C; Shi, Z; Revington, P (October 7, 2009). "Arthrocentesis and lavage for treating temporomandibular joint disorders". Cochrane Database of Systematic Reviews (4): CD004973. doi:10.1002/14651858.CD004973.pub2. PMID 19821335. ^ Kerawala C, Newlands C, eds. (2010). Oral and maxillofacial surgery. Oxford: Oxford University Press. pp. 342–351. ISBN 9780199204830. ^ Kieser CW, Jackson RW (May 2001). "Severin Nordentoft: The first arthroscopist". Arthroscopy. 17 (5): 532–5. doi:10.1053/jars.2001.24058. PMID 11337723. ^ Kieser CW, Jackson RW (2003). "Eugen Bircher (1882–1956) the first knee surgeon to use diagnostic arthroscopy". Arthroscopy. 19 (7): 771–6. doi:10.1016/S0749-8063(03)00693-5. PMID 12966386. ^ Böni T (1996). "[Knee problems from a medical history viewpoint]". Ther Umsch (in German). 53 (10): 716–23. PMID 8966679. ^ Watanabe M (1983). "History arthroscopic surgery". In Shahriaree H. O'Connor's Textbook of Arthroscopic surgery (1st ed.). Philadelphia: J.B. Lippincott. ^ Jackson RW (1987). "Memories of the early days of arthroscopy: 1965–1975. The formative years". Arthroscopy. 3 (1): 1–3. doi:10.1016/S0749-8063(87)80002-6. PMID 3551979. ^ Metcalf RW (1985). "A decade of arthroscopic surgery: AANA. Presidential address". Arthroscopy. 1 (4): 221–5. doi:10.1016/S0749-8063(85)80087-6. PMID 3913437. ^ Allen FR, Shahriaree H (1982). "Richard L. O'Connor, M.D., 1933–1980" (PDF). J Bone Joint Surg Am. 64 (2): 315. doi:10.2106/00004623-198264020-00036. ^ Fucentese, SF; Rahm, S; Weiser, K; Spillmann, J; Harders, M; Kock, PP (Apr 2015). "Evaluation of a virtual-reality-based simulator using passive haptic feedback for knee arthroscopy" (PDF). Knee Surgery, Sports Traumatology, Arthroscopy. 23 (4): 1077–85. doi:10.1007/s00167-014-2888-6. PMID 24519617. ^ Abram, Simon G F; Judge, Andrew; Beard, David J; Price, Andrew J (September 2018). "Adverse outcomes after arthroscopic partial meniscectomy: a study of 700000 procedures in the national Hospital Episode Statistics database for England". The Lancet. 392 (10160): 2194–2202. doi:10.1016/S0140-6736(18)31771-9. PMC 6238020. PMID 30262336. ^ Hame, Sharon L.; Nguyen, Virginia; Ellerman, Jessica; Ngo, Stephanie S.; Wang, Jeffrey C.; Gamradt, Seth C. (2012-04-10). "Complications of Arthroscopic Meniscectomy in the Older Population". The American Journal of Sports Medicine. 40 (6): 1402–1405. doi:10.1177/0363546512443043. ^ Siegel, M. G. (July 1997). "Compartment syndrome after arthroscopic surgery of the knee. A report of two cases managed nonoperatively". The American Journal of Sports Medicine. 25 (4): 589–590. doi:10.1177/036354659702500432. ISSN 0363-5465. PMID 9241000. ^ Yeh, PC; Kharrazi, FD (February 2012). "Postarthroscopic glenohumeral chondrolysis". The Journal of the American Academy of Orthopaedic Surgeons. 20 (2): 102–12. doi:10.5435/JAAOS-20-02-102. PMID 22302448. Wikimedia Commons has media related to Arthroscopy.